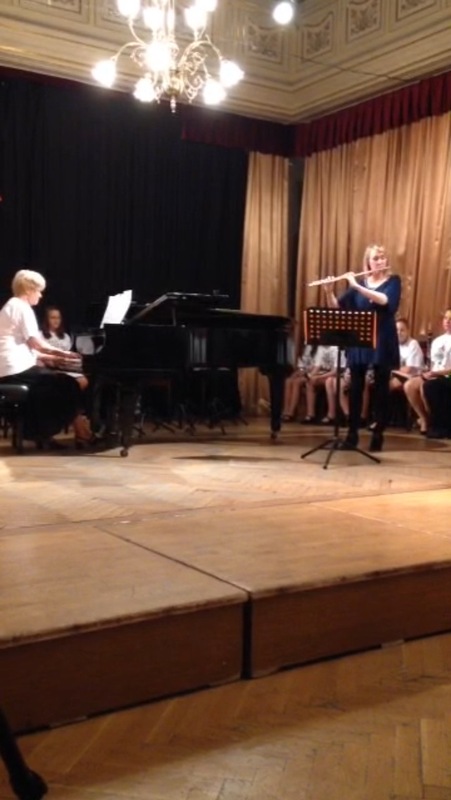 It was a honour to be invited to perform on my flute at the ‘World Music Day’ in Budapest, Hungary and also to meet 15 talented young musicians and staff involved in the concert in their music project entitled “Tuned to Each Other”. 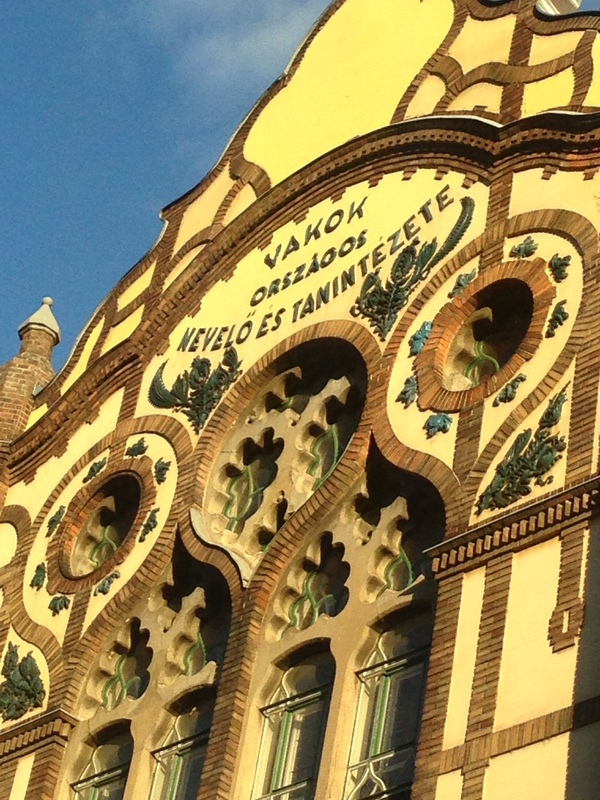 The concert was held on the 1st October 2015 in the evening at the grand setting of the Nador Terem Palatine Hall, which showcased a typically Hungarian Art Nouveau interior with a touch of “Viennese style” to it. The heavy chandeliers filled the room with a soft warm glow providing us with the perfect setting for the event. 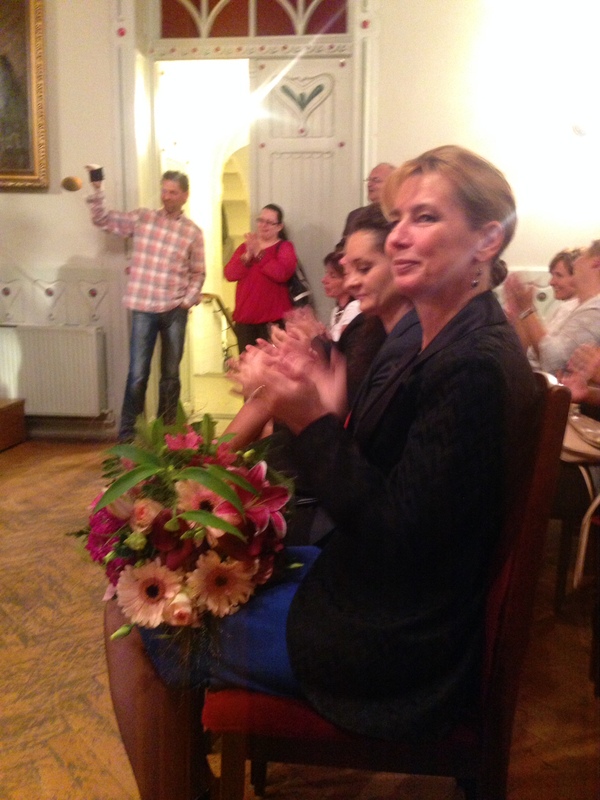 Other special guests included the famous Hungarian pianist Tamás Érdi who was a former pupil of the blind school and the President of the Hungarian Republic Mr. Janos Ader’s wife Mrs Anita Herczegh who was the patron of the concert. 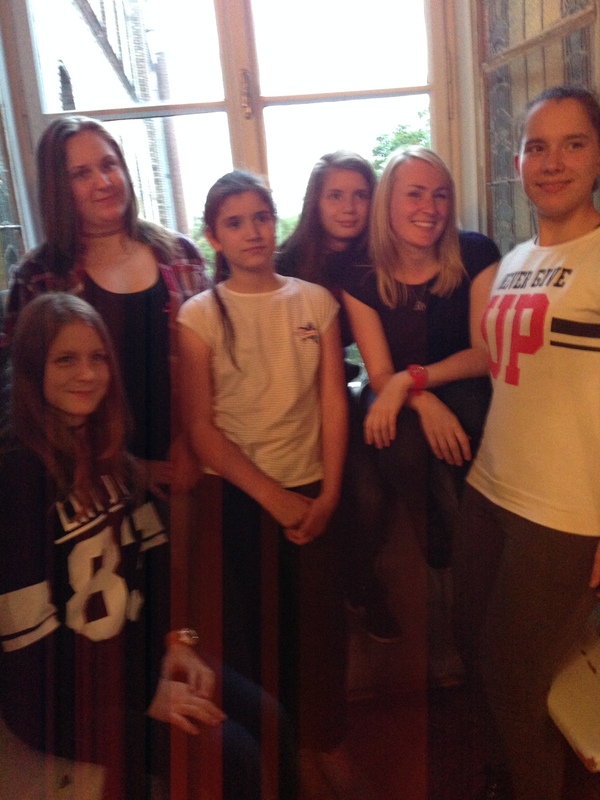 My trip was made possible by the UK charity Decibels and Specialkidz International who kindly supported me in taking part in the concert and leading music workshops. 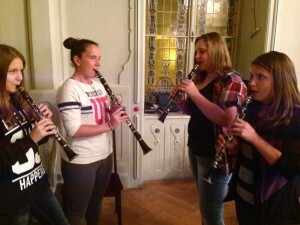 There were 5 hearing, 5 deaf and 5 blind young people from different schools in Budapest participating. The event was organised by Ferenc Boldvai and staff, who initially held a summer camp making music and singing in an ensemble as well as taking part in leisure activities such as horse riding, bob sailing, art making and team games, with the aim of meeting again and holding a concert with the fifteen participants of the camp, empowered by the bonds they had created on the summer camp. The Child Healing Programme of MOL oil company supported the event with an aim to promote trust, friendship and to learn and lean on each other irrespective of their differences. 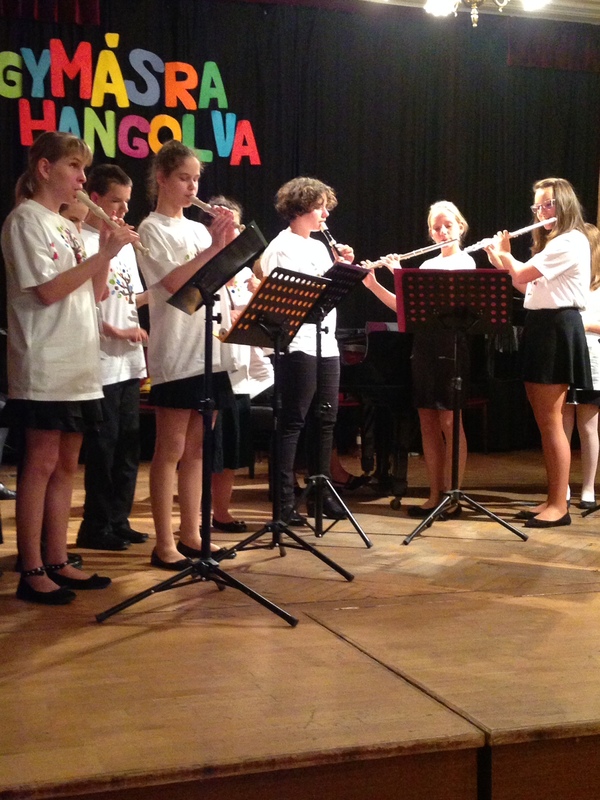 During the week leading to the run up of the concert I visited Nagyothallo school in Budapest. Nagyothallo school is a boarding school which caters for over 200 children with all degrees of deafness from kindergarten to 21 years old with support and early invention programme for families as well as qualified teachers for deaf children. 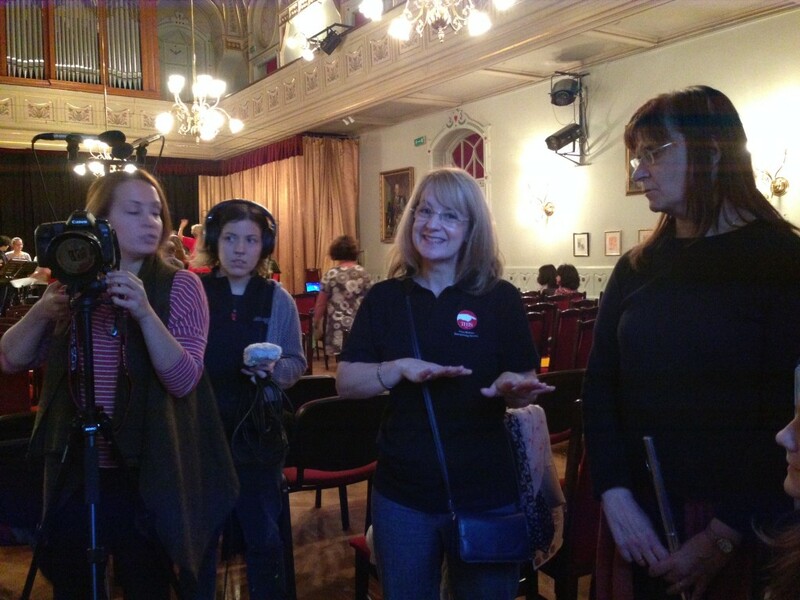 I met some of the deaf children and staff over three years ago the last time I worked at the Palace of Arts, Budapest, and it was a delight to see so many familiar faces. 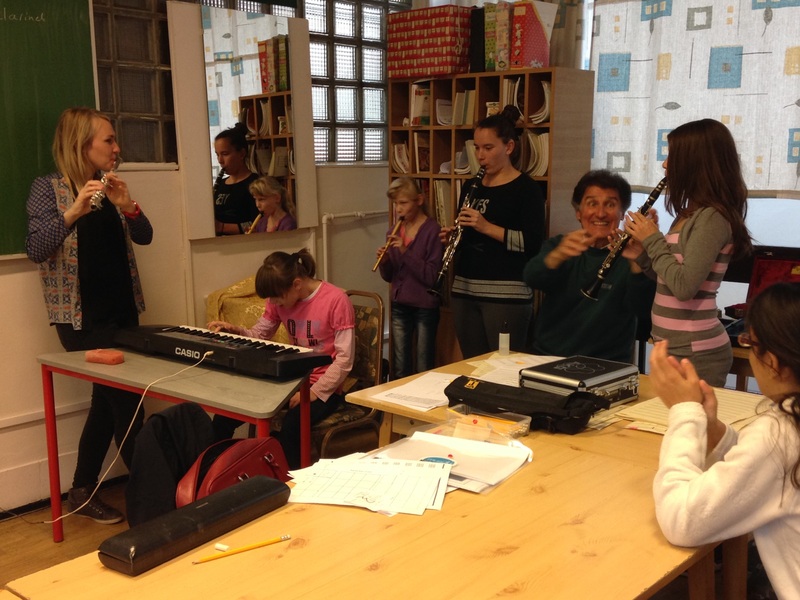 I was pleased that some of the deaf children from my last workshop, now teenagers have progressed on to being clarinet players. 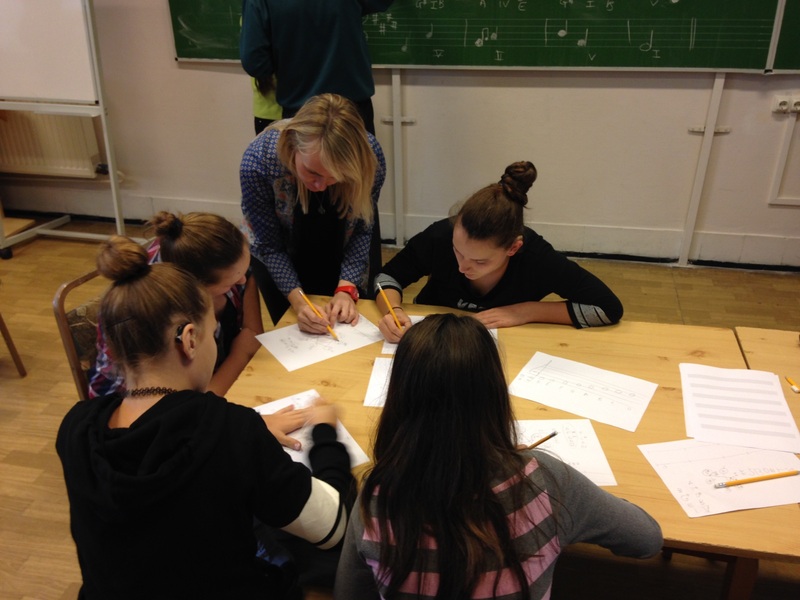 They took the opportunity this time in my workshop to write and compose their own music on staves using simple chord structures in an easy and visual way. 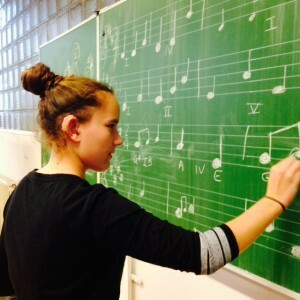 Our communication was very quickly made accessible by using sign language and music writings on the blackboard to explain the theory behind the chords. They produced great pieces, with a lovely sense of melody. 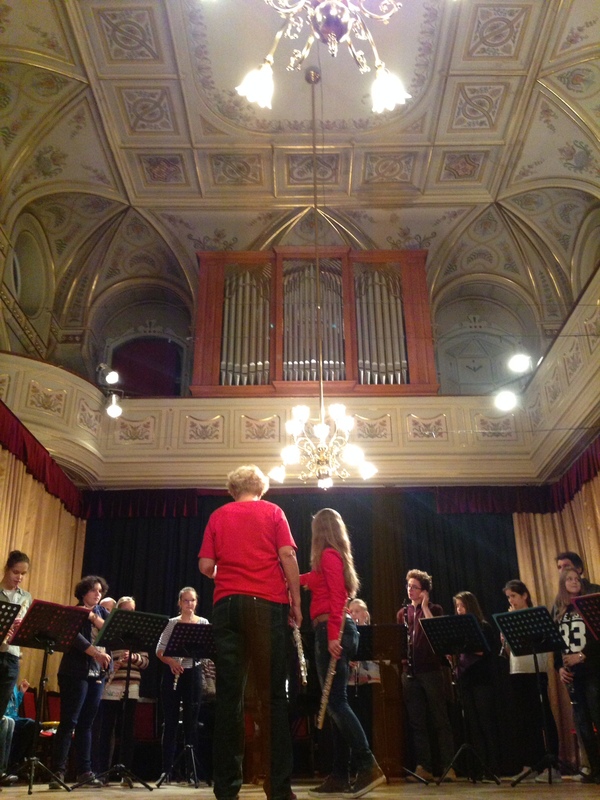 The young children from the local blind school in Budapest joined us with their recorder, clapping hands and keyboard and we played Hungarian folk tunes and rounds. They were very good at playing by ear, keeping to the time, and very quick to learn new music using memorisation. 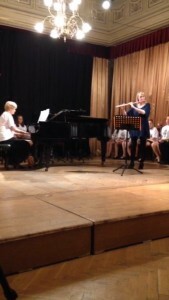 It was a lovely afternoon session playing tunes varying in tempo, key signatures and repetitive patterns. The next day everyone gathered together for a rehearsal Nador Terem Hall inside Vakok school for the blind which is a day and boarding school for around 250 children with all degrees of blindness from Kindergarten to young adults. The deputy Head Teacher led me around the school, showing me equipment such as the brallier (typesetter), and how the table and seating arrangements in the classroom have others facing each other, and also about the blind community, it was so interesting to note some comparisons and differences. 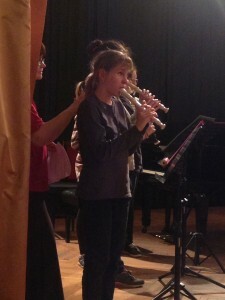 At rehearsals all the 15 young musicians came together to strut their stuff. As they have worked on their pieces for many months individually, getting together to play their ensemble pieces as a whole was like magic brewing as they connected to share the music. The students from Nagyothallo school watched the conductor to make sure they were keeping in time, whereas the visually impaired musicians listened very carefully, with staff standing behind them subtlety tapping on their shoulders to keep the beat as sometimes there were tempo changes instigated by the conductor. On the final day, the people involved in the project changed into their special t-shirts which they painted from their summer camp, a tree with colourful leaves symbolising growth and friendship. They looked very smart. 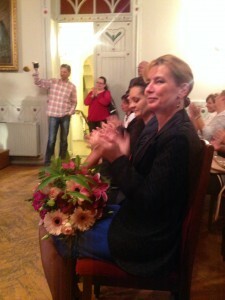 The concert was scheduled to start at 6.30pm, but at 12 minutes past 6, everyone was excited when the President of the Hungarian Republic Mr. Janos Ader’s wife Mrs Anita Herczegh arrived in a mini media scrum. Suddenly the room filled up very quickly, with some people having to take seats upstairs in the balcony. We did the introductions then the music started. 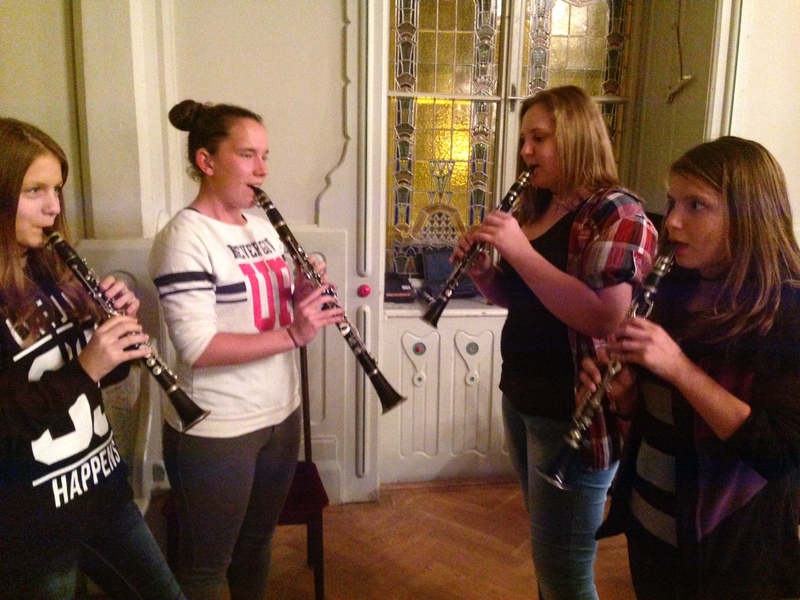 Everyone played on their recorder, flute, clarinet, piano and singing music such as Bartok Folk Songs, Rosamunde by Schubert, in pairs, trios and whole. They all worked beautifully and conscientiously together. Professional pianist Tamás Érdi gave a spellbinding performance of Bartok dances, and I played Chanson de Matin by Elgar for flute and piano which I feel has a lovely melody to share with everyone. When I finished my performance and gave a bow, everyone clapped loudly, and in my eyes, it was also lovely to see a row of hands shaking in the air and I suddenly knew they were members of the signing community. In the end, everyone openly sang the national anthem ‘Ode to Joy’ by Beethoven with immense pride. One of the most incredible things about my journey with people and music is that music is truly for anyone in all walks of life, regardless of their ages and background – it has a unique and powerful way of uniting everyone in one room, as well supporting and admiring their musical talent and skill. I was also very lucky to be given a chance to explore the amazing city in my free time. 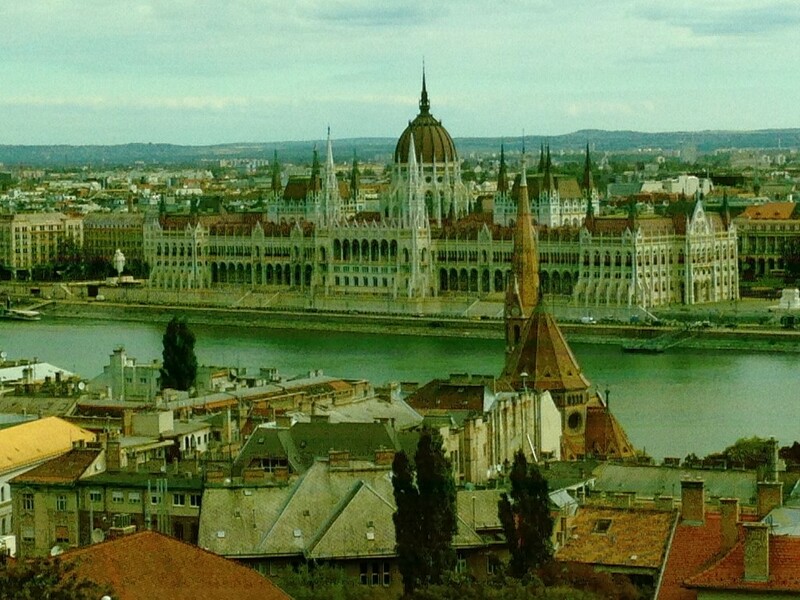 I left Budapest with good memories and hope to meet them again in the future. Concert videos will be uploaded soon! I had very exciting companions with me, Elina and Kiki from the Aristotle University of Thessalonika in Greece on their Media Studies degree – as shown in photo above by the camera. They flew over to Budapest to meet me. Elina and Kiki spent time filming and interviewing us highlighting what music really is, regardless of our deafness. They intend to make a short documentary for their course and to be shown in Film Festivals in Greece. Video will be uploaded when it is finalised.